Renew your WWL membership today! And good news - we now have "rolling renewals" so you will have 365 days after you pay until you need to renew again. Remember that the strength of our organization depends on your current membership. Please renew and show your support of WWL! As always, if you have any questions or concerns about the new renewal process or membership issues, please feel free to contact us. Download our Membership Form-or- Renew Online by selecting the 'Renew until' box under Membership Details on your profile page. To get to your profile, make sure you are logged in, and select the 'View Profile' link under your name in the login box on the top right hand corner of the screen. Judicial members - Please select the chapter that you wish to join. Judicial members may join any WWL chapter with an annual rate of $30. See the instructions for the chapter to get the discount code. Students - membership in one chapter is free. Students should select the chapter they wish to join and enter the discount code to receive free membership in one chapter. See the descriptions for the chapter to get the discount code. Additional guidelines for student members. Non profit/Government Employees - A $10 discounted is available for members working in non profits or for the government. Please enter the discount code of GOVNP at the very bottom of the online application form, after you have indicated which chapter you are joining. 1) Mail a check for the amount to PO Box 46107, Seattle, WA 98146. 2) Use the website to pay electronically with a credit card. Follow the prompts and you will go to a PayPal credit card processor. 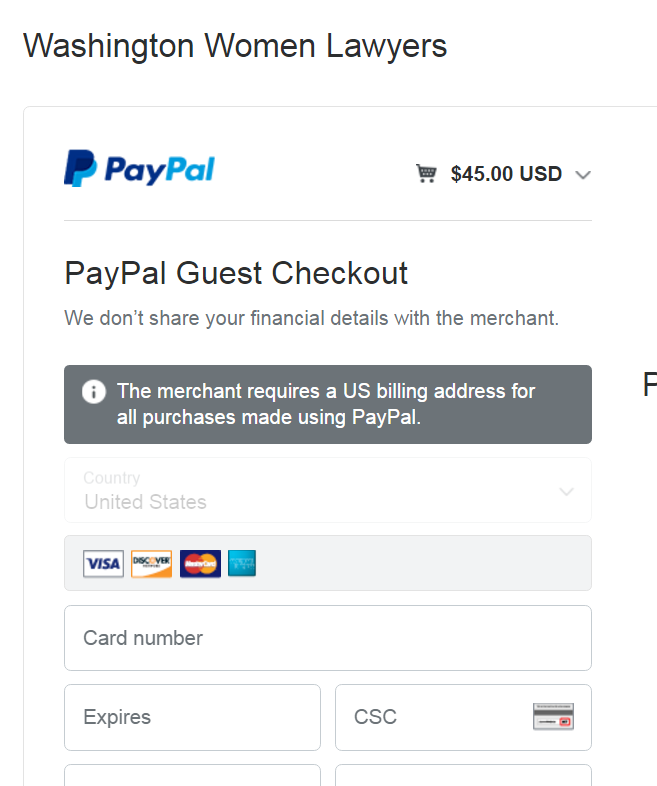 YOU DO NOT NEED A PAYPAL ACCOUNT TO COMPLETE PAYMENT. There is a button at the bottom of the left side to pay as a guest. See the example below. Chapter membership - Capitol - $45.00 (USD) Subscription period: 1 year No automatically recurring payments Membership in one chapter is included in your WWL annual dues. By clicking this option you are choosing Capitol as your chapter. The Capitol chapter is located in Thurston County. You may choose to be affiliated with additional chapters. That option is located below. Judicial members may join at a reduced rate of $30. Use the code JUD15 in the discount code field. Students may register with this chapter. Student dues are free. Enter discount code STUDENT45 at checkout. Government and Non Profit Employees receive a $10 discount. Enter discount code GOVNP at checkout to deduct $10. Chapter membership - Clark/St. Helens - $45.00 (USD) Subscription period: 1 year No automatically recurring payments Membership in one chapter is included in your WWL annual dues. By clicking this option you are choosing Clark/St. Helens as your chapter. You may choose to be affiliated with additional chapters. That option is located below. Chapter membership - King County - $55.00 (USD) Subscription period: 1 year No automatically recurring payments Membership in one chapter is included in your WWL annual dues. By clicking this option you are choosing King County as your chapter. You may choose to be affiliated with additional chapters. That option is located below. Judicial members may join at a reduced rate of $30. Use the code JUD25 in the discount code field. Students may register with this chapter. Student dues are free. Enter discount code, STUDENT55, at checkout. Chapter membership - Kitsap County - $45.00 (USD) Subscription period: 1 year No automatically recurring payments Membership in one chapter is included in your WWL annual dues. By clicking this option you are choosing Kitsap County as your chapter. You may choose to be affiliated with additional chapters. That option is located below. Chapter Membership - Olympic Peninsula Chapter - $45.00 (USD) Subscription period: 1 year No automatically recurring payments Membership in one chapter is included in your WWL annual dues. By clicking this option you are choosing Olympic Peninsula as your chapter. You may choose to be affiliated with additional chapters. That option is located below. Students may register with this chapter. Student dues are free. Enter discount code, STUDENT45, at checkout. Chapter membership - Pierce County - $50.00 (USD) Subscription period: 1 year No automatically recurring payments Membership in one chapter is included in your WWL annual dues. By clicking this option you are choosing Pierce County as your chapter. You may choose to be affiliated with additional chapters. That option is located below. Judicial members may join at a reduced rate of $30. Use the code JUD20 in the discount code field. Students may register with this chapter. Student dues are free. Enter discount code STUDENT50 at checkout. Chapter Membership - Skagit Chapter - $45.00 (USD) Subscription period: 1 year No automatically recurring payments Membership in one chapter is included in your WWL annual dues. By clicking this option you are choosing Skagit as your chapter. You may choose to be affiliated with additional chapters. That option is located below. Chapter membership - Snohomish County - $50.00 (USD) Subscription period: 1 year No automatically recurring payments Membership in one chapter is included in your WWL annual dues. By clicking this option you are choosing Snohomish County as your chapter. You may choose to be affiliated with additional chapters. That option is located below. Chapter Membership - Southeastern WA Chapter - $45.00 (USD) Subscription period: 1 year No automatically recurring payments Membership in one chapter is included in your WWL annual dues. By clicking this option you are choosing Southeastern WA WWL as your chapter. This chapter encompasses Benton, Franklin, Walla Walla, Columbia, Garfield, Asotin, Whitman, Adams, and Grant Counties. You may choose to be affiliated with additional chapters. That option is located below. Chapter Membership - Spokane County - $45.00 (USD) Subscription period: 1 year No automatically recurring payments Membership in one chapter is included in your WWL annual dues. By clicking this option you are choosing Spokane County as your chapter. You may choose to be affiliated with additional chapters. That option is located below. Chapter membership - Whatcom County - $45.00 (USD) Subscription period: 1 year No automatically recurring payments Membership in one chapter is included in your WWL annual dues. By clicking this option you are choosing Whatcom County as your chapter. You may choose to be affiliated with additional chapters. That option is located below. Chapter Membership - Yakima - $45.00 (USD) Subscription period: 1 year No automatically recurring payments Membership in one chapter is included in your WWL annual dues. By clicking this option you are choosing Yakima as your chapter. You may choose to be affiliated with additional chapters. That option is located below. Chapter membership / At large - $45.00 (USD) Subscription period: 1 year No automatically recurring payments Membership in one chapter is included in your WWL annual dues. If you are unsure which chapter you would like to belong to, or you prefer to remain "at large", please indicate that on your application in the field provided.